Byrdy Galernik takes a floater. The sophomore guard will look to help NU win its second conference game Thursday against Wisconsin. 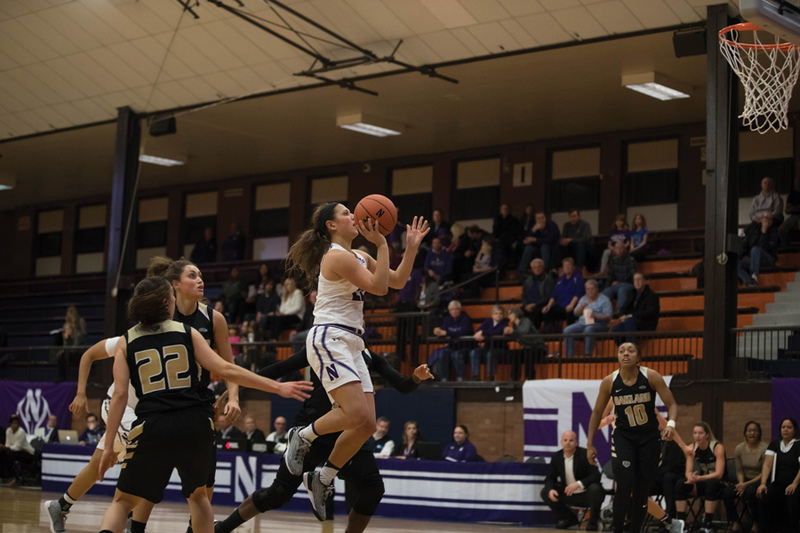 After giving up a 14-0 run that bridged the third and fourth quarters, resulting in Northwestern’s second consecutive Big Ten loss, coach Joe McKeown was still holding the young Wildcats to a high standard. His freshmen backcourt, injury-plagued rotation and short bench have made the start of conference play difficult for NU, (8-10, 1-3 Big Ten) who faces last-place Wisconsin (7-10, 0-4) on Thursday. But when McKeown expressed his disappointment that the team is not competing at the level he expected, he addressed what he said is the Cats’ biggest issue. Though they boasted the Big Ten’s second-best defense for the majority of non-conference play, the Cats have given up more points per game against Big Ten competition than all but three teams, even without having played the top four teams in the conference standings. McKeown said their defensive intensity has been lacking, comparing NU’s lack of movement to a dog restricted by an electric fence. The Cats have given up 3-pointers at a higher rate than all but ten Division I teams, and they have especially struggled on defending the perimeter, as their opponents shoot 33.6 percent from the 3-point line. Injuries to guards Jordan Hamilton and Lydia Rohde have been a large factor in NU’s inconsistent play, McKeown said. Both starters missed multiple games, and as McKeown plays an eight person rotation at full-strength, the remaining players have had to expand their roles. Amid the ups and downs, McKeown said he is looking toward his more experienced players to light a spark offensively after a lackluster showing in the Cats’ 69-59 loss to Nebraska on Sunday. Scheid, who averages 12.3 points, scored only six against the Cornhuskers, and Rohde, NU’s best three-point shooter, was held scoreless. But while Scheid played nearly the full forty minutes against Nebraska, Rohde played just 23, and the senior guard has gradually been losing playing time to sophomore forward Bryana Hopkins, who started in Rohde’s absence and had 6 points and 2 steals against the Cornhuskers. So far, the biggest constant has been junior forward Pallas Kunaiyi-Akpanah, who is averaging a double-double and rates as the third most effective defensive rebounder in Division I. But against Wisconsin’s leading scorers and rebounders, forwards Cayla McMorris and Marsha Howard, Kunaiyi-Akpanah and the Cats’ defense will have to match the intensity McKeown has been calling for.